Pastor Bauler conducting one of the training classes. Have you ever been locked out of your car or house? Perhaps we can look through the windows and see the keys lying right there, but getting to those lonely keys is a mission impossible! Yet when the door is unlocked, without a thought, we are in the car and ready to go. What a difference an open and closed door makes! But it is not only in the physical world that there are open and closed doors. Jesus says, “Behold, I have set before thee an open door, and no man can shut it.” Revelation 3:8. In fact, not just is there one open door, but there are many. “There is a large work to be done, and the vineyard of the Lord needs laborers. Missionaries should enter the field before they are compelled to cease labor. There are now open doors on every side… .” Fundamentals of Christian Education, 359. “If they will labor as the Spirit of God shall direct, He will open doors of opportunity before them for the work of building the old waste places.” God’s Amazing Grace, 326. It is not only when we think that doors are open, but even when they seem closed, the Lord bids us go forward. “A thousand doors of usefulness are open before us. Often we lament the scanty resources available, but were Christians thoroughly in earnest, they could multiply the resources a thousandfold. It is selfishness, self-indulgence, that bars the way to our usefulness.” Ministry of Healing, 206. May the Lord help us to see those thousand open doors before us and press through with triumphs for the kingdom of God. “Praying also for us, that God would open unto us a door of utterance, to speak the mystery of Christ.” Col. 4:3. Heaven’s greatest challenge for eons, now, has been a labor shortage. Ever since a third of the workforce rebelled and walked off the job (Rev. 12:3), God has been calling for recruits. Humanity’s creation was for the purpose of solving this predicament (1BC, 1082); but since the rebellion of this earth, the labor shortage dilemma has grown severely acute. Jesus is pleading for co-workers in His beautiful invitation, “Take my yoke upon you and learn of me.” (Matt. 11:29) For those who have accepted the enlistment, He has sent a memo directing all to put the labor shortage problem on high priority: “The harvest truly is plenteous, but the labourers are few; pray ye therefore the Lord of the harvest, that he will send forth labourers into his harvest.” (Matt. 9:37, 38.) Are we striving to meet heaven’s crying need? Have we ourselves enlisted in His service, and are we actively engaging in recruitment programs? God desires to finish this work, but He needs a qualified, capable, dedicated workforce. “Christ is calling for volunteers to enlist under His standard, and bear the banner of the cross before the world.” Messages to Young People, 24, 25. A comfortable easy chair is probably something all appreciate. Aching and fatigued, plopping into a favorite easy chair brings great relief; but sometimes easy chairs are a dangerous enemy-beckoning loudly when work is calling. There is an even more dangerous easy chair-Satan’s easy chair. “Do not sit down in Satan’s easy chair of do-little, but arise, and aim at the elevated standard which it is your privilege to attain. It is a blessed privilege to give up all for Christ. Look not at the lives of others and imitate them and rise no higher. You have only one true, unerring Pattern. It is safe to follow Jesus only.” “Do not settle down in Satan’s easy-chair, and say that there is no use, you cannot cease to sin, that there is no power in you to overcome. There is no power in you apart from Christ, but it is your privilege to have Christ abiding in your heart by faith, and he can overcome sin in you, when you cooperate with his efforts, putting your will on the side of God’s will.” Testimonies, vol. 1, 241, Youth’s Instructor, June 29, 1893. We have a work to do: overcoming sin in our lives and helping others to overcome. May we vigilantly resisting the call of Satan’s easy chair. One area where our brethren are resisting the beckoning of Satan’s easy chair is the Kalrayan Hills of southern India. Timothy and Anita Tharasingh are working to train youth for the Master’s Service at the Green Pastures School. A group of twenty to thirty young people from various parts of India and with varying levels of English comprehension have come together to become better equipped to be missionaries for the Master. They arrived at the mission training school near the beginning of the year and have been studying intently since. Various teachers come and present different subjects; and when there is a gap in the teachers, they are able to focus on mastering English better. So far the language has been the biggest barrier (since the classes are taught in English); but with translation and practice, it is our hope that this hurdle will be mounted. Classes have focused on understanding the Bible, Daniel and Revelation, church history, health and more. Pastor Mike Bauler has just returned from teaching several weeks on church history, showing the continuum of God’s people from apostolic times, through the Reformation, down to the Advent movement of today. While there, the door opened to do health outreach at one of the Pentecostal churches. Near the end of the church service, Mike was given the opportunity to share Biblically the importance of health, and then afterward everyone in the church wanted their blood pressures checked. Most were found to be in dangerous levels, and thus some brief education about the simple laws of health was given. The people appreciated it so much that the pastor asked Mike to come back the next Sunday and give the entire message. The Lord provided a translator, and once again a message of truth was borne from a Babylonian pulpit! Praise the Lord for His leading. Presently another brother is at the school teaching on conversion and the health message. 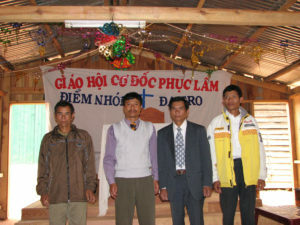 Desiring to do outreach again, they are holding health meetings in one of the local villages. At first very few came because they feared a rush to baptism; but they have persevered, and the Lord has lead them to individuals to whom they can minister. Their attention was brought to a poor, sick man who was deserted by his family-huddled in the corner of his hut, shivering, covered with sores, and racked with pain. Immediately they began to minister to this forsaken man by washing and bandaging his sores. They brought some warmer garments and a meal and promised to continue ministering to him. This act of mercy has begun to soften the hearts of the villagers, and they have begun to help as well. The Lord is working to soften hearts in this heathen country and seeking to prepare bands of workers for Him. We request your prayers as this educational and missionary work advances. Greetings from the southern hemisphere, once again! Although, I left behind the Pacific Northwest summer, the wintery weather of Brazil is actually not much of a difference. I have hardly stayed put in one place for more than a week this whole summer, and the same is true here in Brazil. Having returned from Angola last month, then traveling to a couple different meetings, I had time to pack my bags and be off to the airport again. The Lord is blessing the labors here in Brazil and we praise our gracious Lord for that. The first week here was a campmeeting at the training institution in Taquara (near Rio de Janeiro). It is such a blessing to see brethren hunger and thirsting after truth. The theme of the campmeeting was “religious liberty.” Many wondered how we could spend an entire week studying the theme of religious liberty, but by the time we had finished, most wished there had been more time to dive into this essential subject more deeply. There were three visiting speakers who had sermons and seminars, roundtable discussions and private questions that were asked. We all knew that the Lord had been with us and that there was still much precious truths to learn on this pertinent subject for our time. What a blessing it was, though, to interact with the students there and see an army of dedicated workers being trained. The first graduation of the students took place last November and many of those who graduated are now working in Bible work or assisting in the various needs at the institution. There are around twenty to thirty young people still studying, some of which will graduate in this coming November while others will continue their studies further. Praise the Lord that there are faithful institutions holding high the principles of truth from the Bible and Spirit of Prophecy that are sending out workers into the harvest field! ‘In matters of conscience the majority has no power.’ This principle we in our day are firmly to maintain. The banner of truth and religious liberty held aloft by the founders of the gospel church and by God’s witnesses during the centuries that have passed since then, has, in this last conflict, been committed to our hands…. A ‘Thus saith the Lord’ is not to be set aside for a ‘Thus saith the church’ or a ‘Thus saith the state. '” Acts of the Apostles, 68, 69. We indeed are living in a grand and awesome time. While the media focuses upon international crises, economic woes and celebrity happenings, we know that these mundane episodes are nothing compared with the real issues. We are living in the measuring time! The judgment is going on! “The grand judgment is taking place, and has been going on for some time. Now the Lord says, Measure the temple and the worshipers thereof. Remember when you are walking the streets about your business, God is measuring you; when you are attending your household duties, when you engage in conversation, God is measuring you. Remember that your words and actions are being daguerreotyped [photographed] in the books of heaven, as the face is reproduced by the artist on the polished plate.” Bible Commentary, vol. 7, 972. Are we caught up in the affairs of this world or are we focusing on the real, eternal events? How do we measure in this measuring time? I have had opportunity to contemplate this great measuring time as I have just returned from a series of campmeetings in Angola in which the themes were “The Judgment Hour.” Angola is a country coming out of nearly thirty years of civil war, but a country with believers eager to share the good news of the Third Angel’s Message. A team of five of us from three different continents descended upon this south-central African country: I from the United States, three students doing part of their internship from Brazil and the brother from Portugal who has been communicating and working with the brethren in Angola for many years. (Angola is Portuguese-speaking and thus the close association with other Portuguese-speaking countries.) Being the first time for most of us in Angola, we were very interested to learn the experience of the brethren there. We found a group of faithful brothers and sisters who are earnestly sharing the message with others. Around fifteen years ago, an interest was awakened as some of the brethren began to study more deeply into the prophecies of the Bible and the Spirit of Prophecy. As they studied, a revival began to take place as they realized that many counsels relating to health and Sabbath keeping were being ignored. As they studied and shared, they began to face opposition; but they were not deterred. As they continued sharing the truths they dearly held and were studying, the Lord blessed their efforts, resulting in baptisms and new churches. As we learned their story, we were eager to share the messages the Lord had put on our hearts. The first of the campmeetings was held in a central province about six hours from the capital city. After a lengthy but providential trip, I arrived in Angola on a Friday morning; and we immediately left for the campmeeting. The Lord blessed as we gathered under a temporary savannah-grass structure to study the Word of God and share His goodness. After the campmeeting, our team of visitors divided to travel to two different provinces for more campmeetings. After a grueling multi-day trip to the eastern side of Angola, we were very thankful to be at our next site of ministry. As always, the campmeeting was filled with the study of the Word, baptisms, ordinations, marriages, etc. ; but best of all was seeing how the brethren are excited about living and sharing their faith. After the campmeeting, we were on our way to the final campmeeting in Luanda, the capital city. The other campmeetings had been attended by one to three hundred believers and visitors; but on our final Sabbath in Angola, the attendees swelled to over a thousand. What a blessing to know that the Lord has faithful workers around the world who are seeking to prepare a people for the coming of the Lord! 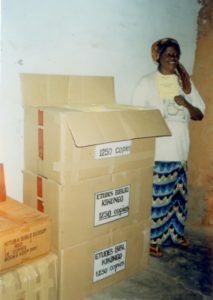 A container load of truth-filled literature is on its way, and soon the brethren will be distributing hundreds of thousands of brochures to the masses of Angola. Please pray for the brethren, that the Lord will bless their church-planting and evangelistic efforts in this solemn judgment hour. “We have no time to lose. The end is near. The passage from place to place to spread the truth will soon be hedged with dangers on the right hand and on the left. Everything will be placed to obstruct the way of the Lord’s messengers, so that they will not be able to do that which it is possible for them to do now. We must look our work fairly in the face and advance as fast as possible in aggressive warfare. From the light given me of God I know that the powers of darkness are working with intense energy from beneath, and with stealthy tread Satan is advancing to take those who are now asleep, as a wolf taking his prey. We have warnings now which we may give, a work now which we may do; but soon it will be more difficult than we can imagine. God help us to keep in the channel of light, to work with our eyes fastened on Jesus our Leader, and patiently, perseveringly press on to gain the victory.” Testimonies, vol. 6, 22 (1901). This note of warning sounded one hundred plus years ago needs to be trumpeted with even greater urgency today-we have no time to lose! Soon it will be more difficult than we can imagine. Let us work with all our might now, while we still can. There are places in the world today that the work is already more difficult than we can imagine. There are countries where epidemics are not just a news story, but a sad fact of daily life; countries where travel, if it existed previously, is already greatly restricted; countries where money is virtually useless anyway. While there are many countries like this today, my thoughts are turning in particular to the Democratic Republic of Congo. The work is moving forward despite the fact that it is more difficult than we can imagine; they strive to work for the Master daily. As they were laboring for the Master, an epidemic of cholera and influenza struck bringing nearly everyone and everything to a screeching halt including tragically the lives of some of the brethren and families of Bible workers. Fortunately most have recovered and are about their work again with renewed desire to work while the day lasts. The calls continue to come in from the entire area, making the need of materials and workers even more urgent. instead. 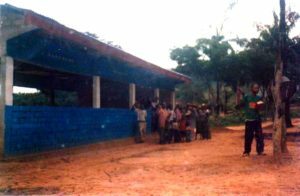 Twenty-five Bible workers continue to gather the villages together to open the Word of God, under the trees, in a mud church or in one of the few cement churches. Fifteen schools are seeking to educate the children to be useful in this life and prepared for the life to come. Praise the Lord for the work that is moving forward amidst difficulties greater than we can imagine! Please uplift our brethren in Congo before the Lord, as they daily bring us to our Father in heaven, and see how the Lord would have you assist them with Bibles, churches, clinics, Bible studies, schools and, most importantly, souls saved in His kingdom! As the lone angel was joined by an innumerable shining throng to swell the glad tidings “glory to God in the highest” across the Bethlehem pastures, so today we have been promised that the message of “fear God and give glory to Him” will swell to a loud, earth-encircling cry. How we look forward to that time! For the final message to echo from plain to mountain and city to village thrills our hearts with longing expectation—when thousands gladly grasp the testing truths for this time. But have we stopped to consider that this world-changing message must swell to a life-changing message in our hearts first? “If, on the other hand, we live up to all the light that shines upon us, that light will continue to increase, and we shall have a clean record in heaven. The third angel’s message is to lighten the earth with its glory; but only those who have withstood temptation in the strength of the Mighty One will be permitted to act a part in proclaiming it when it shall have swelled into the loud cry.” Historical Sketches, 155. May we allow the light of truth to continually swell in our own hearts and lives that we may act a part in proclaiming present truth with a loud cry. we were able to share the truths from the Bible regarding the signs of the times, the second coming and the rapture, the law of God, Daniel 2 & 7, the Sabbath, the mark of the beast, the United States and Armageddon. Many shared how the studies had been a tremendous blessing to them. One sister said that her son had been preaching to her about the Sabbath for years, but it really came together in the seminar. Another lady was extremely convicted on the Sabbath and was troubled for her two grown daughters whom she had taught to worship on Sunday. An impact was definitely made as around fifty people came to the seminar and another fifty-plus people that were unable to attend requested the study materials. Even though it was an abbreviated seminar, nearly everyone requested the set of CDs of the full length meetings, so the message will continue to sound in their cars and homes! Please pray that the Lord will continue to lead them fully into His truth. individuals to study and learn the truths from His Word. We have concluded the first weekend of ground-laying studies and will advance into deeper prophetic studies in the upcoming weeks. Next week, our theme will be exposing the fallacy of futurism—uncovering the rapture deception, unmasking the antichrist and showing the true sanctuary in heaven, not a supposed Jerusalem temple. After that we will move into showing how nearly the entire world will be led to worship the beast and receive its mark, with many other prophecies along the way. The Lord has filled up the room, and many have shared how the studies have been such a great blessing to them and are desirous to know when we will hold another seminar so they can invite more of their friends and family. We pray that the interest will remain high and that the Lord will draw into His fold those who are desirous to follow Him all the way. Please keep these interests in your prayers, and may the message continually swell until it is that unavoidable loud cry arresting the attention and calling for a decision from all.